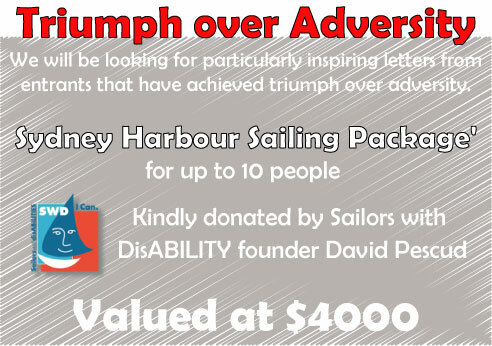 Sailors with disABILITIES founder, David Pescud, has donated our Triumph over Adversity prize. A Sydney Harbour Sailing Package for up to 10 people, valued at $4000.00. David Pescud is himself dyslexic, like so many other dyslexics he did not let that stop him from achieving success in life. In 1993 when he was ready to retire and sail around the world he heard an appeal on radio from a young paraplegic man who wanted to sail in the Sydney to Hobart Race. This simple appeal set him on course to found Sailors with disABILITIES, an organisation that aims to encourage people with a disability or those in difficult circumstances to see things in a new way through sailing. SWD has been helping thousands of people with a disability, disadvantaged children and adults, and their carers every year for over 2 decades now. This program offers sailing opportunities to children with disability. For many it's a small step on the journey towards accepting their circumstances and believing they can achieve more. Creating Opportunity for Disadvantaged Youth. This program goes beyond the traditional classroom and didactic teaching and instead offer interactive and engaged learning through the medium of sailing. This program is a chance for the amazing mums, dads, grandparents, guardians, brothers, sisters, friends and others who care for disabled and disadvantaged people, to take a bit of time out for themselves. SWD are always looking for new people to get involved, whether it be through volunteering, sponsorship or a donation. Go to their website www.sailorswithdisabilities.com to learn more. You can also follow them on Facebook, YouTube, Instagram & Twitter.